'One on One' with Theresa Marteau. Professor Marie Johnston, my main PhD supervisor, who is one of the most scientifically fluent psychologists I have ever met, able to turn most – if not all – behavioural observations into testable and competing hypotheses drawing upon a wealth of psychological theories spanning the last century. Getting my first grant. Complete beginners’ luck. I was working in Oxford as a clinical psychologist increasingly aware that my interest in psychology lay outside of the clinic. Sid Bloch, an eminent group psychotherapist who was supervising me running some groups at the time, introduced me to a friend of his, David Baum, a paediatrician with a special interest in childhood diabetes. David and Sid were fascinated by how families coped with the daily threats posed by having a child with this disease. Together we applied for a grant from the then British Diabetic Association. This funded my PhD, with Marie Johnston becoming my primary supervisor. And so began my research career, which can be measured out in grants that have enabled me to follow several lines of inquiry culminating in my current focus on changing environments to change behaviour to improve health. ‘A manifesto for reproducible science’ by Marcus Munafò et al. in Nature Human Behaviour in 2017. If you are a researcher, read and then ensure you have systems in your research group or department so that all research – from undergraduates to senior professors – is conducted in accordance with the principles outlined in this landmark paper. ‘The temporal pattern to the experience of regret’ by T. Gilovich and V.H. Medvec in the Journal of Personality & Social Psychology in 1994. This paper explains why, in the longer term, we generally regret inaction when facing a significant choice. Recounting this evidence empowered one friend to resolve his ambivalence over a career choice that would involve leaving a very good post in London and accepting the offer of one in Oxford. Almost 20 years later he has no regrets about moving to Oxford (obviously!). The son of a good friend recently thanked me in his wedding speech for my evidence-based encouragement for action when he was agonising late one evening about whether to fly out that weekend to Baghdad to rekindle a relationship. None. But at least I understand the psychological processes by which I have arrived at this position. Everyone Lies: Big Data, New Data, and What the Internet Can Tell Us about Who We Really Are by Seth Stevens-Davidowitz (HarperCollins, 2017). The book takes us from the cerebroscope – a mythical device that would display a person’s thoughts – to our online searches as an open-source method for studying human behaviour. In addition to revealing some of our surprising, but mercifully hidden preoccupations, the joy of this book is the author’s creative use of these data to formulate and test a range of hypotheses, including the phenomenon of Freudian slips. You’ll have to read the book to find out how the test was done and what the data tell us. Bach’s Goldberg Variations. Preferably played by Murray Perahia and, for those already familiar with these, Robin Holloway’s Gilded Goldbergs. Some psychologists have a tendency towards imperialism about their discipline, an observation made about sociologists by the sociologist Phil Strong some years ago. Greater humility about what our discipline can bring to address key questions about human behaviour and greater recognition of what we can achieve together with cognate disciplines could, paradoxically, strengthen our contribution. Achieving a significantly larger share of research funding. This will require us to demonstrate more effectively the value of greater research investment in psychological and behavioural sciences. Arguably this should be easiest in my area of research – changing behaviour to prevent disease and reduce health inequalities. While funding has almost doubled in the last 10 years – from about 3 per cent to 5 per cent – it remains far too low given how much we could contribute. Photography. As a student, I spent many happy hours in dark rooms imbibing the smell of photographic fixer enabling the miracle of the negative made positive. William James for his astute observations and inferences about human behaviour: ‘Ninety-nine hundredths or, possibly, nine hundred and ninety-nine thousandths of our activity is purely automatic and habitual, from our rising in the morning to our lying down each night’ (William James, 1899). Beat that for language and predictive validity. It’s one of the great things psychology has achieved: generating the evidence that much of our behaviour is cued by our environments, often outside of our awareness, an effect far greater than we humans like to believe it is. This encompasses the work of James, as well as the social psychologists working after the Second World War to understand ‘Man’s inhumanity to Man’, including Milgram, the work of Mischel and other situationists, as well as Kahneman and Tversky. Stationery. There are two groups of people in the world: those for whom heaven is a cornucopian stationery cupboard – with irresistible notebooks awaiting your thoughts, pens with the finest nibs and inks of every hue – and those for whom it isn’t. I sat behind two young men on a train who were composing a letter to me on behalf of a colleague seeking an internship in my research group. I kept my head low in case they recognised me from our website that they were accessing at the time. I didn’t have the heart to tell them that the answer would not be in the affirmative. ‘Changing human behavior to prevent disease: The importance of targeting automatic processes’ – this is a short paper in Science in 2012 that outlines the behavioural and neuroscientific basis for my research focus on changing environments to change behaviour to prevent disease and reduce health inequalities. - Dame Theresa Mary Marteau is a health psychologist, professor, and director of the Behaviour and Health Research Unit at the University of Cambridge. 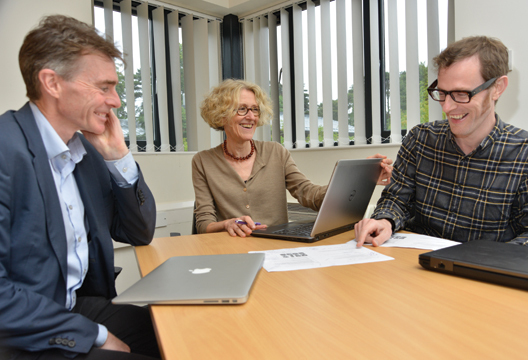 Pictured here with Professor Paul Fletcher (left) and Dr Gareth Hollands, planning their Wellcome Collaborative Award in Science Behaviour Change by Design. Professor Marcus Munafò is the fourth grant-holder (not pictured).